Create your own page in bakery history in Bakery Story 2! Bakery Story 2 is the sequel to the massively popular Bakery Story. In this sweet sequel, you manage your own bake shop, gain levels and experience, create recipes, collect ingredients from nearby vendors, customize your decor and much more. A tasty treat of a game! In Bakery Story 2, the recipes you make are dependent on the ingredients you have available in your area, just like real life! Hit the surrounding shops and source ingredients for your next culinary smash hit. Be careful though; shops sometimes have a hard time managing supply and demand. Use your local resources wisely! As you bake the latest and greatest culinary creations, you will gain valuable experience. This experience translates to levels, and reaching higher levels gives you access to more advanced recipes and ingredients. Progress for success! The customers in Bakery Story 2 are key to success, just like in any real life venture. Treat your customers like royalty and your efforts will pay off bigtime in the form of upgrades and other incredibly helpful things. Advance and expand your bakery enough and you'll be in such hot demand, customers will start placing to-go orders! If you can keep up with this challenging new facet of your business, you'll enjoy numerous rewards and ever increasing popularity! Need a bigger pantry? Getting sick of local vendors just not having the storage space to keep up with your demands? The solution is simple: upgrade! Upgrade your pantry, appliances and even the local stores in your area to meet your specifications. Make your bakery a unique reflection of your taste and style! Customize the look and feel of your bakery to give off a distinctive vibe that's all your own. Need a change of pace? Decorate your space again and again! 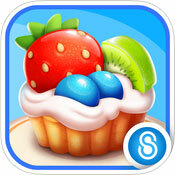 Hook Bakery Story 2 up with your Facebook account to serve up some sugary sweetness to your friends. Ask and be asked for Quick Serve items that are great for those moments when demand eclipses supply. Visit your friend's bakeries*, observe their decor and style and see who runs the best bakery in your circle of friends! As the number of regular customers increases, you'll start seeing some of the same faces frequently, and this is a great opportunity to get to know these people better. Learn more about the people in your community, and observe relationships, love, heartbreak and more. Life is sweet! Bakery Story 2 is the sequel to the original which, at the time of this writing, has over 75 million downloads. So clearly the original got something right in a big way. 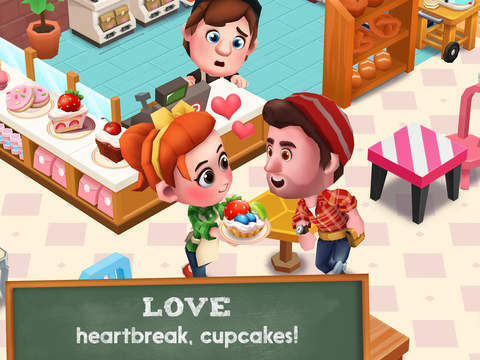 Is Bakery Story 2 a sweet and satisfying game worth downloading? Read on to find out! You start with basic recipes. Master these and execute them well, and you'll soon gain enough experience to level up. When you level up, you will unlock more complex recipes that will start to earn your bakery distinction from others. Keep up the hard work and your bakery will earn its own page in the bakery history books. Sweet! Having this strong sense of progression is a great motivator to keep baking and making! Measurable progress makes Bakery Story 2 consistently fun to play. Some players are crazy about unlocking and upgrading, and if you're one of those players, Bakery Story 2 is going to make you one happy camper. Upgrade your appliances. Upgrade the shops nearby. Unlock newer and better ingredients. Unlock better, tastier recipes. Once again, Bakery Story 2 delivers big time in regards to progression and accomplishment. So very fun! Customize Your Bakery, Your Way! There is something satisfying about decorating a space, and in Bakery Story 2, players are more than welcome to personalize everything about their bakery. The walls, the floors, the chairs... tweak the decor to suit your own taste and style! At this point, your decorating prowess will be for your eyes only, but Facebook friends will be able to visit your bakery in a future update, giving you plenty of opportunity to get your Martha Stewart on and impress your friends and family! The graphics in Bakery Story 2 are pretty, polished and vibrant. The 3D characters are well done with just the right amount of cuteness and personality. The food isn't exactly photorealistic, but it blends well with the other graphics and looks nice overall. The sound is pleasant and relaxing, albeit a little bit generic. Think really fabulous Muzak. Inoffensive and unobtrusive, but not something you'd buy as a standalone soundtrack. If you hook Bakery Story 2 up with your Facebook account, you'll be able to help your friends out by sending them Quick Serve items. They can do the same for you, creating a sweet circle of mutual helping and sharing. Bakery Story 2 is sugary sweetness served up with a big ol' dollop of pretty pastels. This is soft and pleasant to look at. For players with a very high tolerance for cute, this is a pro. For those who are averse to the sweet and girly, it could be a con. As you build up an ongoing relationship with your customers and they make a habit of frequenting your bake shop, you'll start to get peeks into their lives. Upon witnessing one particular exchange between my customers, it dawned on me that Bakery Story might be named for this! I blame King and their many Sagas; I'm so desensitized to ridiculous, senseless names that I didn't even question what put the 'story' in Bakery Story 2. Lots of interesting things happen with the customers. The customers and their stories, dramas and personalities are a delightful addition to the game that I find myself looking forward to more and more. 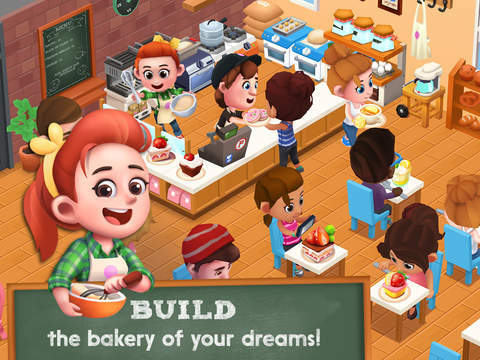 As wonderful as Bakery Story 2 is, if you've played the original Bakery Story or other restaurant management games (think Cafe World), you've basically played this game before. It's a delightful rehash of all the games before it, but it's still nothing new. For some players, this will be a con. However, if you've got room in your heart and phone or tablet for another game cut of the same cloth, you'll be rewarded with a very pleasant game that's a wonderful way to pass the time. When I was playing this game, I lost my internet connection temporarily and was surprised to find that it affected my ability to run my sweet shop. No internet, no Bakery Story 2. It could have been a glitch that hasn't yet been ironed out, or it could be that this game doesn't allow offline gameplay. If this isn't a bug and it's a 'feature' instead, that's a con for anyone looking to pass the time outside of internet coverage. Decorating your bakery is very addictive. This is good, but it's also bad given how horrendously expensive it is to purchase new looks for your space. Unfortunately, customizing decor costs gems, and gems aren't easy to come by. So if you want a sweet looking bake shop, you're probably going to end up dropping some dough (pun not intended, but I have no regrets). With that said, Bakery Story 2 isn't too demanding on the wallet otherwise, so it could be a whole lot worse. Bakery Story 2 offers a solid take on the restaurant management concept. It's a blast to play, with tons to unlock, upgrade and do. For fans of the management game genre, it's sure to please. If you're looking for something fresh, unexpected and unique, this game isn't it, but if you're looking for the familiar recipe that management games are known for, Bakery Story 2 will make you happy. Overall, Bakery Story earns a very solid 7.0: Great!. Very fun to play!